From the first echoes of the imposing Michael Patrick Thornton’s voice bringing the devastatingly charming Father Flynn’s voice into the space (a charismatic Michael Patrick Thornton), we are submerged in a flickering Catholic Church. The first moments of Doubt by John Patrick Shanley produced by the Gift in Steppenwolf’s 1700 space caused the audience to be simultaneously reaffirmed and frightened by Flynn’s sermons. His tone suggests that if we just listen close enough we will avoid the temptations of which he speaks. The spectators are few, two nuns and a dignified Black woman, she is notably separated from the rest, seated between the nuns and the Father. This is an intentional choice by director John Gawlik, manifested by Mike Durst’s deft lighting, that would later prove relevant. Doubt won the Pulitzer Prize in 2005 and yet the questions it asks us in regard to our faith in charismatic men have never been more timely. Placed neatly in a beautiful yet imposing container by scenic designer Arnel Sancianco, the audience feels moved to quite literally pick sides in the alley space. Scenes are often played with actors at stark opposition in the space, and the occasional moments of physical intimacy and proximity are almost not to be trusted. It is, as though only when distancing oneself emotionally can you see the truth. When painfully optimistic Sister James, played with alternating innocence and surprising conviction by Cyd Blakewell, sees something that puts suspicion upon Father Flynn’s reputation she is forced into action by Sister Aloysius Beauvier (Chicago legend Mary Ann Thebus). Let me be the first to say, Sister Aloysius Beauvier does not play. She pursues justice with the ferocity of a pitbull, refusing to let go of Father Flynn’s arm until he capitulates to what she believes he has done. In a scene with Jennifer Glasse, playing Ms. Muller, Glasse questions Beauvier’s motives in attempting to corner Father Flynn. Glasse and Thebus play a scene that is tough to stomach, with Miss Muller suggesting that suffering is sometimes essential for good. It cloaks this discussion in the necessary evils that Black people must face in order to move through the world. She even ironically states that the word is not just black and white, reminding me forcibly that this play is placed in 1964 and written by a white man in 2005. Yet the essence of the scene – what people are willing to ignore in the face of talent and some good – is played effectively by Glasse. There is something about watching Thebus walk around with her book that reveals the bones of the craft of acting in a truly exciting way, and provides us with one of the most satisfying moments in the show – a literal read. If you are unfamiliar with the slang definition of this term, to “read” is to “read someone to filth” meaning you essentially verbally tell them all about themselves and make them wish they’d never been born through a series of well-executed jabs that directly correlate to their character. Peering over her pages with a fire that made my eyes water, in an epic tête-à-tête with the superbly talented Thornton, she laid him absolutely flat. Lies, truths, and doubts about all fling through the space, the sound by Matthew Chapman reminded us constantly that we could be sure of nothing. And at the end of Doubt I found that I was sure of very little. Every viewpoint was presented with certainty by the actors, and the murky conclusion in which it leaves us furthers the philosophical questions. Do we step further away from God the more we pursue judgement, and decide the fate of other men on our own convictions? If we do not, who will protect the innocent? Doubt is a captivating and hauntingly relevant show, executed by a brilliant creative team. 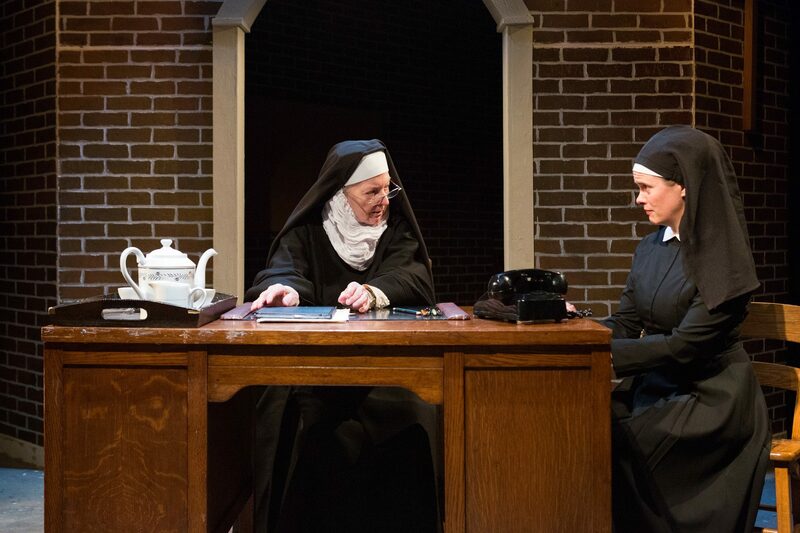 Doubt is presented by The Gift Theatre and runs at Steppenwolf’s 1700 space until March 31st.